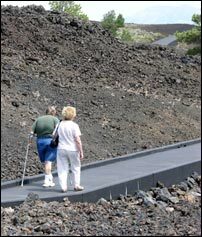 Paved pathways make rough lava fields accessible. One of the most extraordinary geologic sites in North America is located within a couple of hours of Twin Falls, Idaho. The Great Rift volcanic zone is a fifty-three mile-long tear in the earth's crust that extends roughly from the southern end of the Pioneer Mountains to a point that is eighteen miles northwest of the town of American Falls on Interstate 86, just to the west of Pocatello. The Great Rift varies in width from just under a mile to slightly over five miles and was the source for scores of volcanic eruptions and huge lava flows dating back nearly 17 million years. Geologists have found evidence of major eruptions happening on average every two thousand years over the last 10,000 years. It is thought that the source of magma and mantle heat that fed these lava flows could be the same one that is currently causing heightened activity in the Yellowstone basin which, in turn, is of growing concern to the administrators of Craters of the Moon National Monument. One of the largest lava fields in the Great Rift volcanic zone is located in Craters of the Moon National Monument. The Craters of the Moon lava field had sixty separate flows and is the largest basaltic lava field in North America. 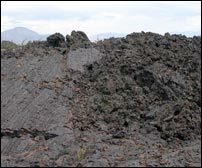 This "rip in the earth's crust" has provided an easy way for roadtrippers to get an up-close view of amazing volcanic structures like cinder cones, shield volcanoes, lava tubes, volcanic bombs, tree molds, and the three principal forms of lava -- pahoehoe, block and a'a. You could fly to Hawaii and see some of these features being formed in real time -- but this is a lot easier.